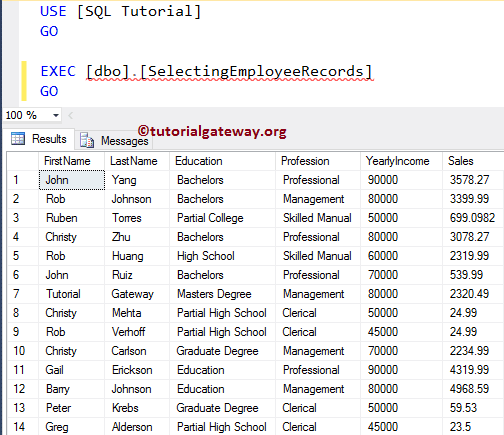 The Stored Procedures in SQL Server are saved collections of one, or group of SQL statements stored in the SQL Server. 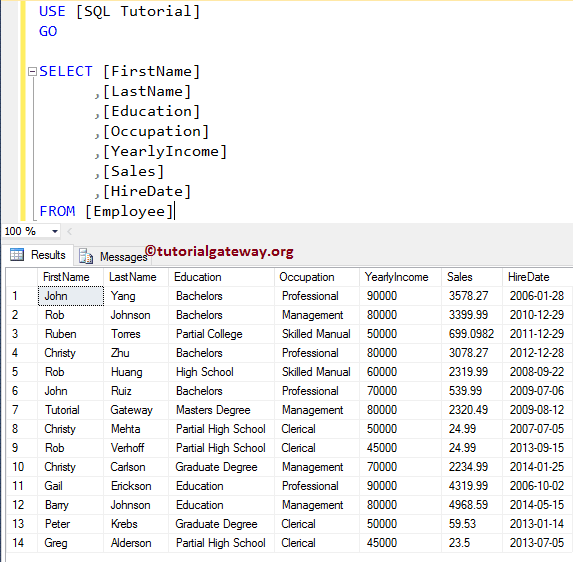 In this article we will explain you, How to create, rename, Modify, and delete Stored Procedures in SQL Server with examples. All the Stored Procedures are pre-compiled, and their execution plan is cached. So, when you execute the same Stored Procedures again, then it will used the cache. It will help you to encapsulate the business rules and policies. For example, database admin will create a procedure, and multiple users will access the procedure from JAVA, C#, C++, Python, R etc. Instead of sending hundreds of lines of SQL code, it is better to use stored procedure. So that we can call the single statement (stored procedure name), rather than writing the complex statement or sending it over the network. Before we get into the practical example, let us see the syntax of a stored procedure. Schema_name: Please specify the schema name. For example, dbo, or Humanresource etc. Procedure_Name: You can specify any name you wish to give other than the system reserved keywords. Please try to use meaningful names so that you can identify them easily. 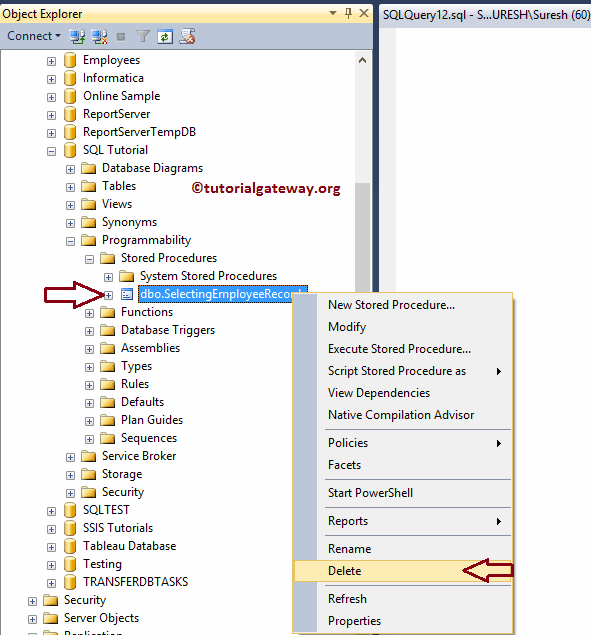 In this example we will show you the steps involved in create a SQL stored procedure using the SQL Server Management Studio. 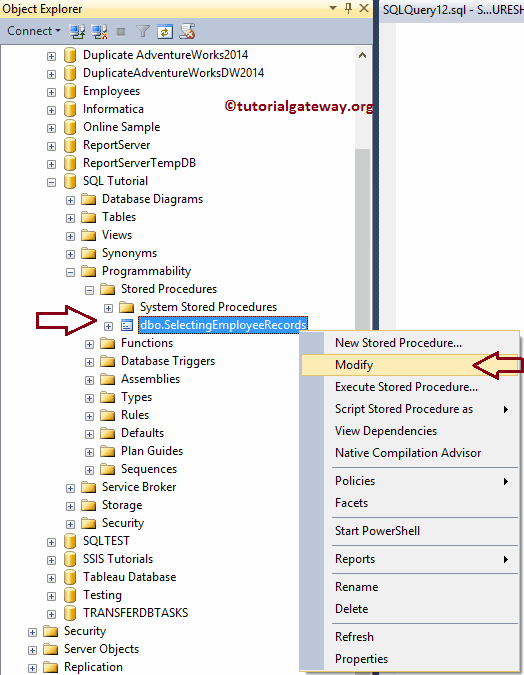 Before we start creating any procedure, let us see whether our database had any stored procedures. In order to view the existing Stored Procedures, Please select the Database -> Programmability -> Stored procedures. 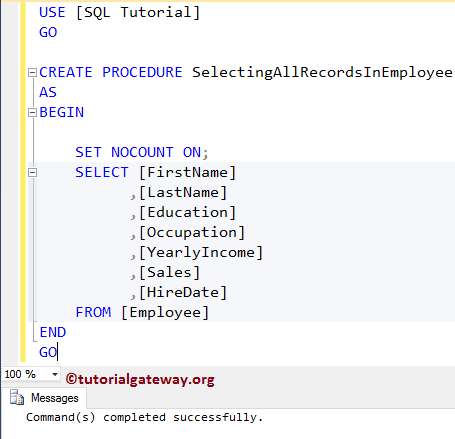 From the below screenshot you can observe that, our [SQL Tutorial] database has no procedures. 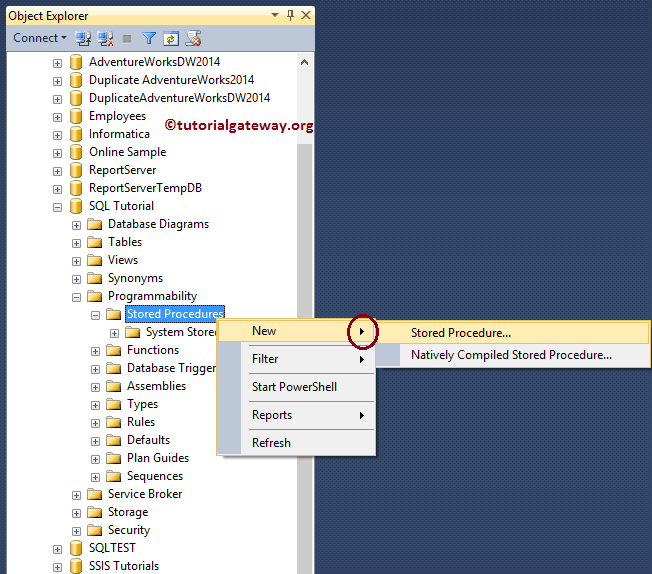 Right click on the Stored Procedures folder will open the context menu. 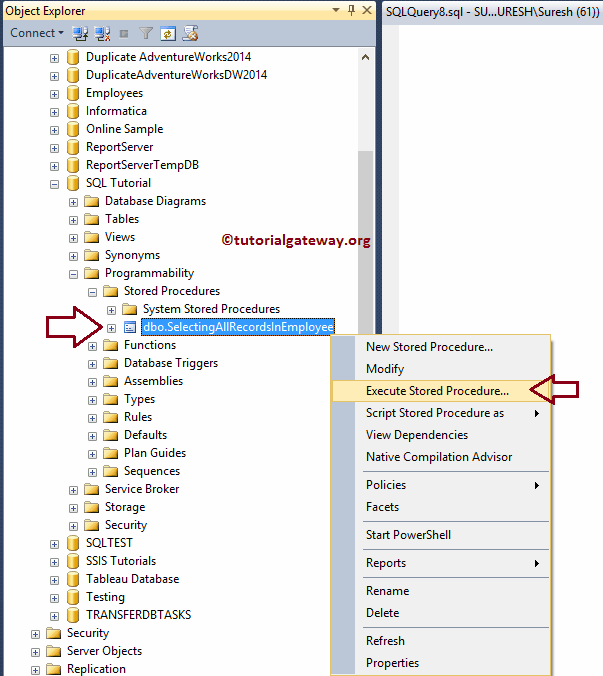 Please select the New -> Stored Procedure.. option from the context menu as shown below. 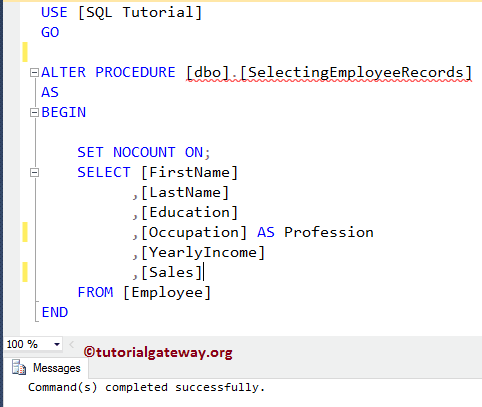 Here, you can add the Procedure name, Parameters (if required), and the Procedure (or SQL Query) you want to use. As you can see that, the command has completed successfully. 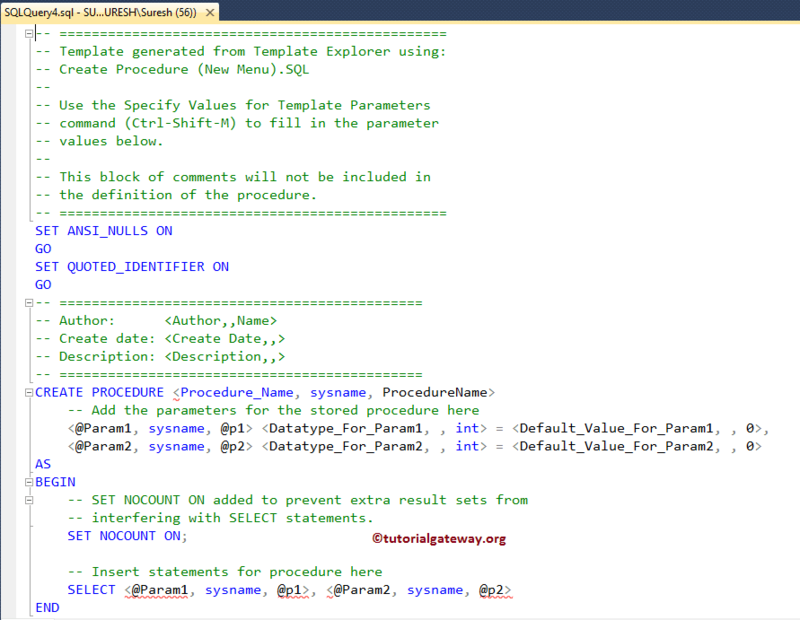 The following screenshot will show you the Stored Procedure that we created now. 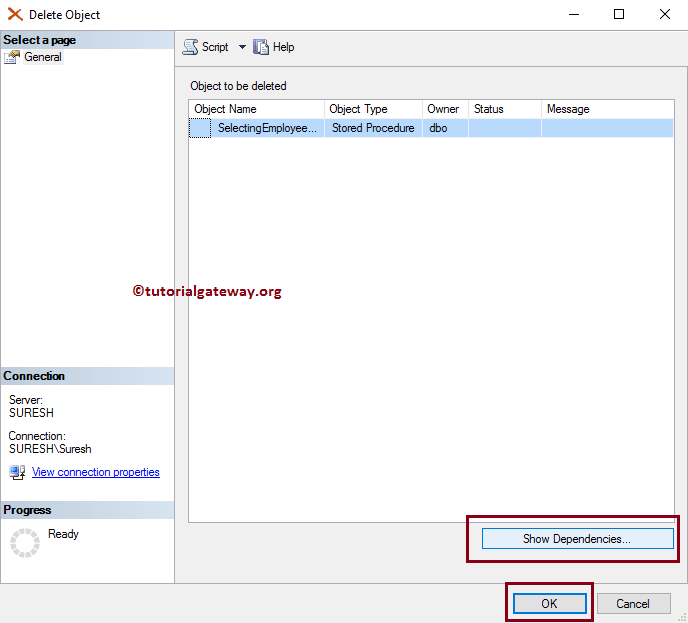 In this example we will show you, How to execute a Stored Procedure in SQL Server using the SQL Server Management Studio (SSMS). There is no such thing called renaming the Stored procedure. This is because, renaming a stored procedure will not change its corresponding object name within the sys.sql_modules. So, if you want to rename any existing stored procedure, then DROP and recreate it with new name. From the below screenshot you can see that, we successfully deleted the old stored procedure, and created the new one. 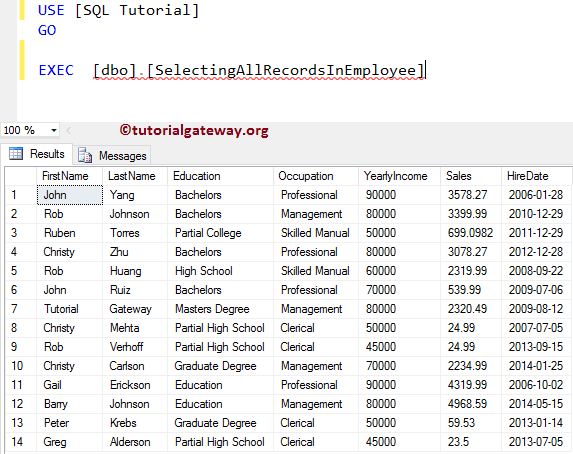 The following examples will help you understand the steps involved in modifying the SQL Stored Procedures using the Microsoft SQL Server Management Studio (SSMS), and Transact-SQL Query. Once you select the Modify option, a new query window will be opened with auto generated ALTER PROCEDURE code. You can modify as per your requirement. 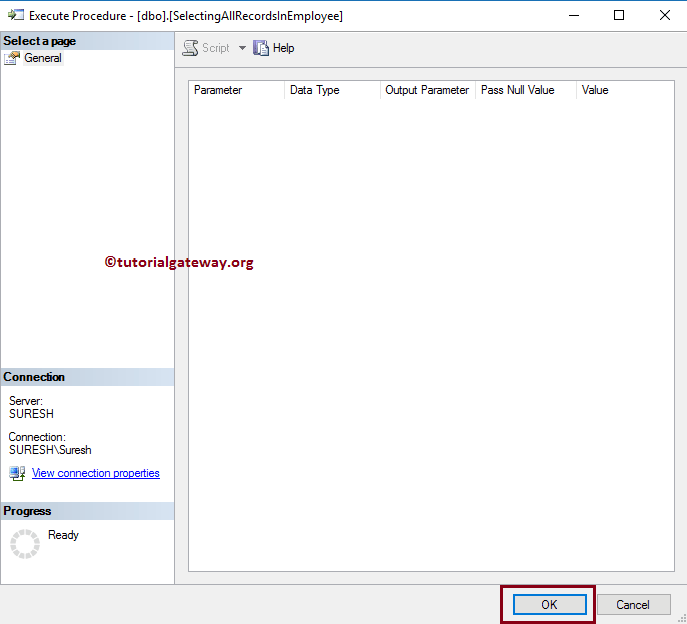 This example will show you, the steps involved in modifying the existing stored procedure using ALTER PROCEDURE statement. To do so, Click New query and return the following query. Let us execute the procedure to check whether we successfully modifies the procedure or not. 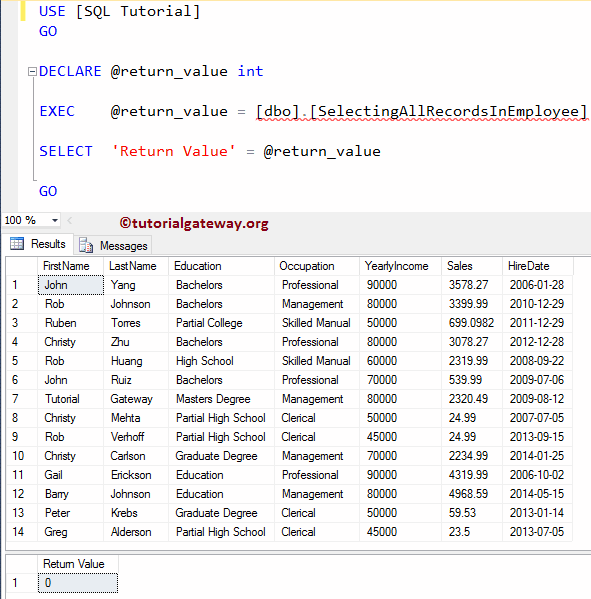 The following examples will show you, How to delete or drop the SQL Stored Procedures using the Transact-SQL Query, and Microsoft SQL Server Management Studio (SSMS). 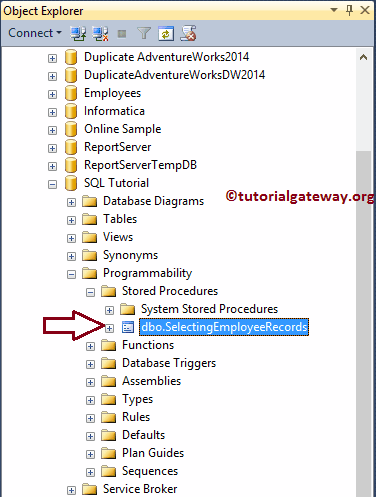 For this Sql Server stored procedure demonstration we are going to delete SelectingEmployeerecords. Once you select the delete option, a Delete Object window will be opened as shown below. Click on the show Dependencies button to check the dependencies, and then click OK to delete the stored procedure. 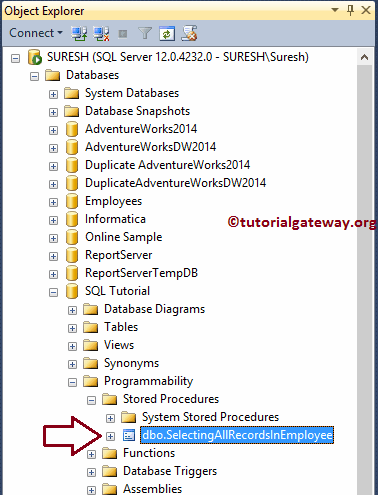 In this example we will show you, How to delete the stored procedures in SQL server using the T-SQL query. 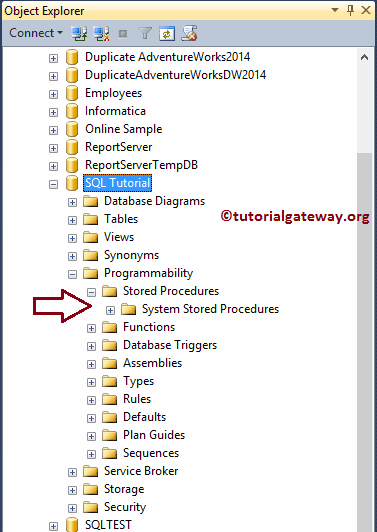 Following are the list of suggestions that might help you to improve the Sql Server stored procedures performance. 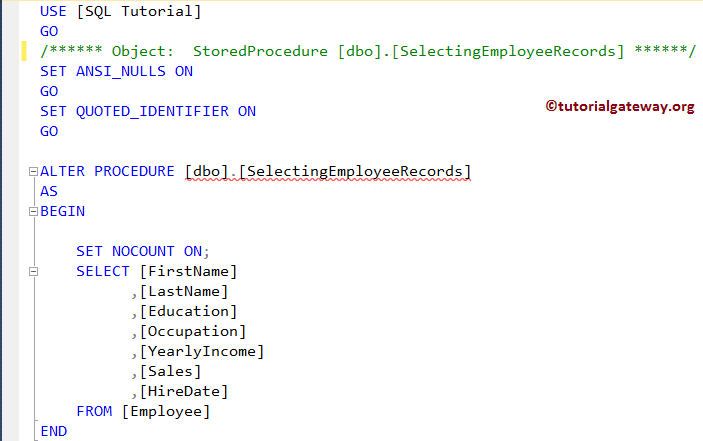 Try to use the Schema Names while you creating, or referencing any database object. It will decrease the database engine processing time. While Creating, or altering a table using (CREATE TABLE or ALTER TABLE), use the DEFAULT Keyword to assign the default values to the Columns. This will prevent the NULL values, and assign those default values to the column data. Rather than Extracting, or Inserting large amount of data, try to work with less, and essential data. This will reduce the query processing load, and increase the query performance. Use the SET NOCOUNT ON statement within the sql server stored procedure. This will turn off the messages that are sent by the SQL Server to the Client. It includes number of rows updated, deleted etc. Try to replace the UNION Operator, or OR Operator with the UNION ALL Operator, unless you are looking for distinct values. If possible, avoid using the SCALAR Functions in the SELECT Statement that returns large amount of data. This is because, scalar function is applied on each row (row basic), so it will the query performance. Always use the BEGIN..COMMIT TRANSACTION within the Stored Procedure. Remember that, the transaction should be as short as possible, otherwise there is a danger in either deadlock or longer locking.